For the very first time in the history of history, the unbeaten American boxer champion Floyd Mayweather had been knocked out in a sparring session last Sunday. 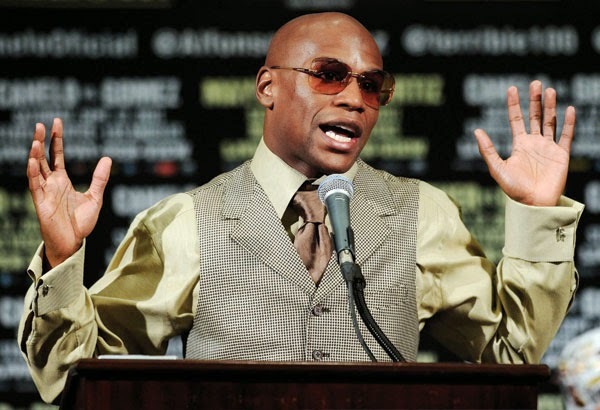 An un-confirmed news from an unknown source who happens to be inside the Mayweather Boxing Club said that Mayweather had been knocked down by Zab Judah during their sparring session. The source said, "Zab hit Mayweather with a good shot, a left hook to the body, and he went down," and added, "To my knowledge Money has never gone down ever. Not in sparring, or in the ring." The source even said that it's not really that surprising, 'cause boxers do really get hit during any sparring session and Mayweather just showed that his just as normal as anyone else. Source statement says, It's not unusual for a boxer to get hit hard in training and go down. And Floyd responded well. When he got up, he finished the session," and added, And he beat Zab to a bloody pulp, however he was down for more than a 10 count so technically he was knocked out." To give everyone a brief record 'bout Zab Judah or Zabdiel "Zab" Judah, he is the former Undisputed World Welterweight Champion just like Floyd Mayweather. Comments or suggestions about "Unbeaten American boxer knocked down during Sparring session" is important to us, you may share it by using the comment box below.